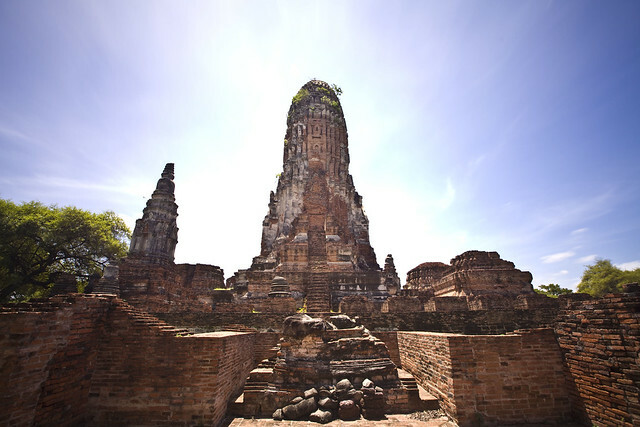 As I was nearing the end of my tour in Ayutthaya and I can’t take the heat under the scorching sun any longer, I insisted to have another go with the BIG Stopper which I had set up with my tripod while walking around Wat Phra Ram area, with my skin burning and hurting me ore for every single minute I spent. Finally, I found myself a spot where I can compose my shot without any subjects in the foreground as it was still not so crowded with tourists yet. 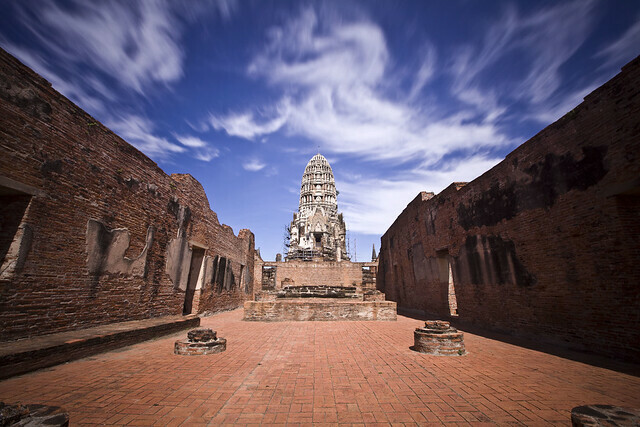 It was indeed a fun day for me grabbing pictures from Ayutthaya with BIG Stopper on long exposures with clear blue sky and scattered clouds to add in the movement in my capture. This was again taken with my 5D II with 16-35mm f2.8L. Yes, this camera setup has brought me a long way on my photography stint. For my case, photography is very addictive. Once I have gotten a hang of it, I will want more even if it means that I have to spend another half an hour directly under the scorching sun. The sky was a clear blue one with scattered clouds so there was a little shade for me to hide under. Trees are not really that abundant that I can easily find a spot to position my tripod and compose my frame for my next shot. Right after capturing the central prang in Wat Ratchaburana as you can see in my previous post, Wat Ratchaburana in Big Stopper part 1, I decided to walk around the area to try my luck finding another subject for my long exposure shot with Big Stopper by LEE filter. I was a little uncertain when I found another prang that I can take a long exposure shot because this time, the cloud movement was not I expected it to be, but I gave it a shot anyway. I was very contented that it came out well! Unlike the previous post about Wat Ratchaburana in Big Stopper part 1, I have to adjust my settings as the exposure was different. With my 16-35mm f2.8L II on 5D II, I used a shutter speed of 30secs and f-stop of 9.0 so that I can get a long exposure with Big Stopper and get the correct exposure. I simply love the movement in the clouds. It was a short walk from the bus station in Ayutthaya to a shop that rents bicycle for visitors to cycle around the area at their own free time. Of course, Tuk tuk was an option that I didn’t choose as I like to explore the area at my own time, own pace and economically. Once I have gotten my rented bicycle out of the shop, the tip of a pagoda in Wat Ratchaburana caught my eyes from far immediately. So that made my first destination. Wat Ratchaburana is situated close to Pa Than bridge and opposite Wat Maha That which was founded by King Borommarachathirat II in 1424. 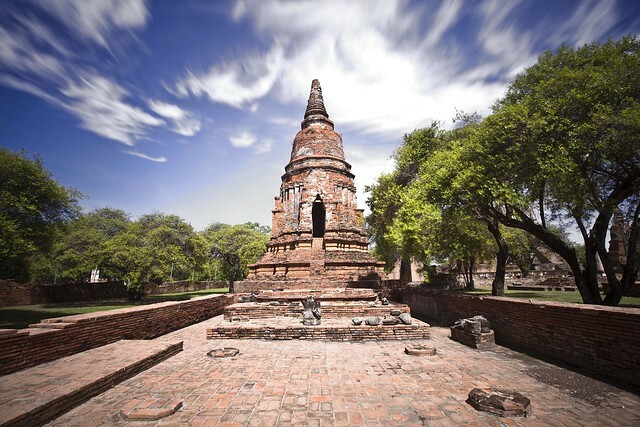 So it was indeed very interesting visiting Ayutthaya with such history that has a long way back! I had in mind to make a different photograph this time and I set up my tripod with 16-35mm f2.8L II on 5D II and mounted my LEE filter holder onto the lens but my Big Stopper was kept safely in my pouch and I would only take it out when my tripod was set down firmly to prevent any accident. I wanted to capture a long exposure shot of the central prang as the sky was blue with scattered moving clouds that met my expectation of a long exposure shot with Big Stopper! I used a shutter speed of 30secs with f-stop of 14 to give this picture a long exposure time. I can only remember myself walking uphill and downhill trailing on endless flights of stairs that seems to lead me to nowhere during my visit to the death railway in Kanchanaburi. Finally, I saw a small resting shed and I was looking forward to take a good rest from all the climbing which took quite a toll of me. What happened next was totally unexpected! As I approach the shed, I realized that the shed does not only provide resting shade for visitors but also a wonderful picturesque view of the Khwae Noi valley! So that gave me a reason to take a longer rest because I need to compose my pictures from the shed, I sat myself down on a bench and positioned my tripod just in front of me, all these were done while I’m seated. I got my 5D II with 16-35mm f2.8L II and started taking long exposure shots with my Big Stopper, at the same time, I never stopped appreciating the beauty of the landscape. I simply love how the movement of the clouds were captured in this picture, all moving in similar direction and casting shadows on the hills at the far end. This lookout is a breathtaking as well as a surprise one for me as I have never expected such beautiful view like this. This picture definitely made my memories of the valley fonder. 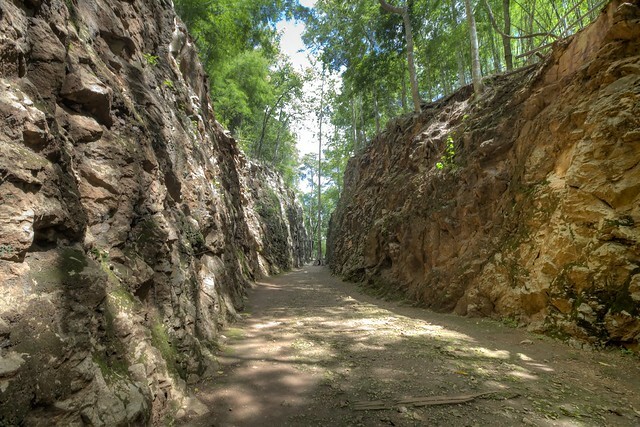 Hellfire pass which is also known as Konyu Cutting (in Japanese) describes a cutting of a section of Tenasserim Hills to make way for the railway tracks to pass through. Konyu Cutting was done with forced labor by the POWs (Prisoner Of War) during World War II. Hellfire pass was well known for this cutting because during the time when the POWs were digging in the night with torchlight and the sound of their pain and suffering all resembles the scene in hell. When I first saw this cutting, I can totally imagine how tough it can be to dig and make this cutting! With the poor technology back then, this was a really hard labor with only hammer and nails and I was amazed! I took a slow walk around to imagine how many POWS were sacrificed and how they suffered during the process of cutting this section as it was so obvious to me that this section was certainly very tough to dig and cut! I found myself a spot at the end of this section and took a single RAW picture before separating them into 5 different exposures before blending them into HDR (High Dynamic Range) using photomatix. I really can’t imagine that this beautiful and peaceful place used to be filled with horror, sufferings and death. 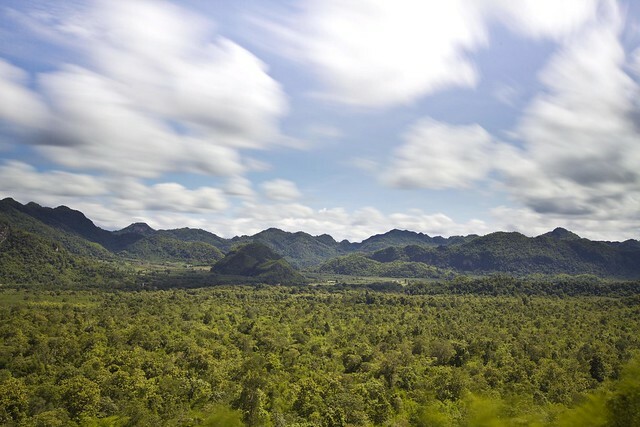 The Burma Railway, also well known as Death Railway was built by the Japanese using the POWs (Prisoner Of War). 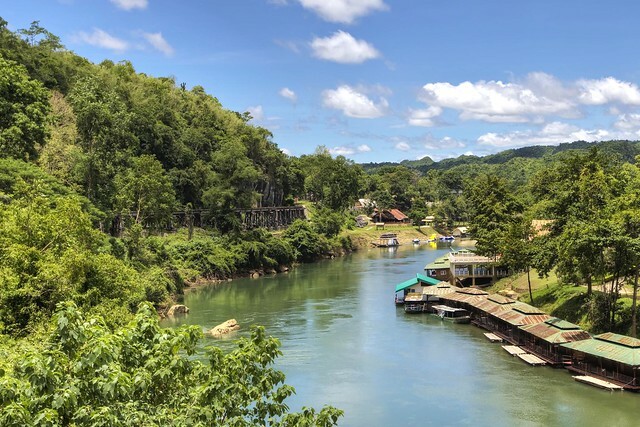 Thousands have lost their lives during the construction of the Death Railway and this cliff hugging railway is one of the tourists attractions in Kanchanaburi, Thailand. 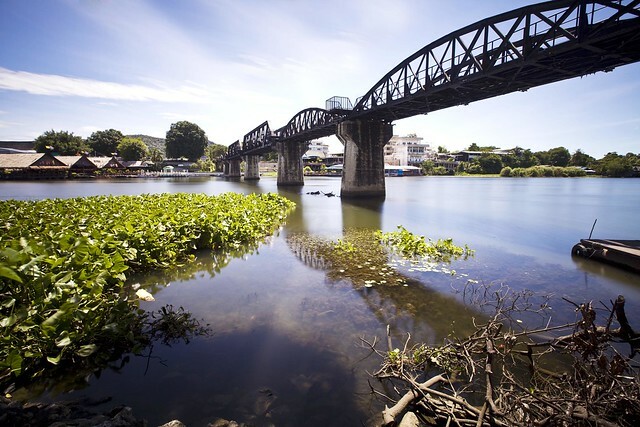 It was an easy walk along the tracks as platforms were built on the tracks for visitors to walk on and enjoy the scenic view around the river. I was in the morning and with the empty tracks with no visitors around, I grab a shot of this picture in a single RAW file and then separated them into 5 different exposures before blending them into HDR (High Dynamic Range) using photomatix software. This was taken by my 16-35mm f2.8L II on 5D II. One marvelous thing about visiting the bridge on the River Kwai is that I had my long exposure done Big Stopper with balanced exposure! Even though the sun was hot and shining through the clear blue sky, I still managed to figure my way to the position to capture this shot of the bridge on Big Stopper. I can’t imagine that I have been to a town that is seated by the border of Myanmar and standing in a historical war site with thousands of tormented souls sacrificed during the building of the bridges and railway tracks that linked Ban Pong, Thailand to Thanbyuzayat, Burma meant for the transportation of supplies to India where the Japanese had planned to attack. This bridge had its two central spans rebuilt as it was bombed by the Allied forces in the past. It was an easy walk along the railway track as side platforms were laid on the tracks for visitors to walk on. I crossed this bridge to the opposite side of where I came from and found myself a spot nearest to the water where I can still the water surface and motion-blur the clouds in the blue sky with the bridge as my main subject. I have tried composing my shot from the other side of the bridge to my right in the picture but couldn’t find a favorable spot to nail the picture I want in mind.